Castelnaud-la-Chapelle is dominated by the most visited castle in the South of France. The picturesque village lies on the left bank of the Dordogne River. During the Middle-Ages, the mighty English fortress commanded the strategic position at the meeting of the Dordogne and the Céou Rivers, opposite the rival French castle of Beynac. The oldest mention of Castelnaud Castle dates back to the early 13th century at the time of the Albigensian crusade. The castellan of the time – Bernard de Casnac – was a powerful local lord and possessed the neighbouring strongholds of Domme, Aillac and Montfort. A fervent defender of Catharism, he was renowned as being particularly cruel toward Catholics. In 1214, Bernard de Casnac and his family were driven out of his castle by the Catholic knight Simon de Montfort who established his garrison there. A mere one year later, de Casnac returned to reclaim possession of the castle once again and hanged all members of the enemy garrisoned there. The revenge of the Catholics was not long after either: only a few months de Casnac’s attack, the archbishop of Bordeaux ordered the castle to be burnt down. Unfortunately, no remnants of this era survive today, except perhaps some reddened stones – some of which might have been reused for the construction of the new fortress. When the Hundred Years’ War between the kingdoms of France and England broke out, the fortress entered into the possession of Nompar de Caumont, who married the last heiress of the castle, Magne de Castelnaud. Nompar de Caumont was an ardent supporter of the English cause and made Castelnaud one of the most prosperous and powerful places in all of Périgord, in the image of Beynac Castle, the neighbouring stronghold which supported the French crown. Castelnaud Castle changed hands between the English and the French a total of seven times. 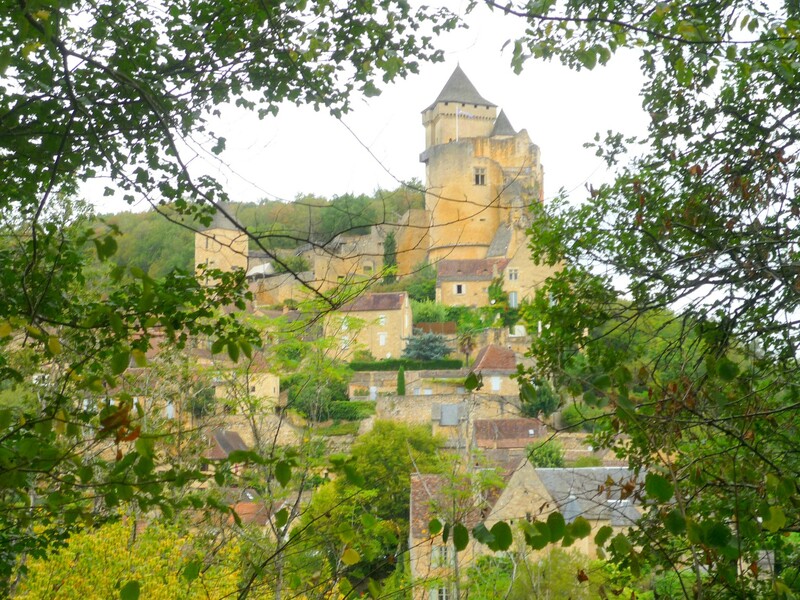 In 1442, the King of France ordered a siege of the English castle, during which the Count of Périgord and local lords offered financial support for Sarlat’s bourgeois to take Castelnaud back again. After three weeks of siege, the English captain Pascal de Theil resolved to hand over the keys of the castle in exchange for the sparing of his life and 400 écus. The English influence over the region ceased definitively, 11 years before the French victory of Castillon (17th July 1453) which marked the end of the Hundred Years’ War. After the war, the Caumont dynasty returned to Castelnaud and rebuilt the fortress, improving its defence system: a new barbican and drawbridge were added to the bastion. Having lost its strategic purpose, the imposing artillery tower built around 1520 no longer had any function other acting as a symbol of power. When the Wars of Religion broke out, the Caumonts pleaded allegiance to the Protestant faith. The Huguenot captain Geoffroy de Vivans, born in Castelnaud Castle, defended the place and fought furiously against the Catholic armies in Périgord. He heroically took possession of the bastide of Domme after a memorable climb up the cliffs upon which stood the town. It is probably thanks to the fearful reputation of Geoffroy de Vivans that any potential attackers were deterred in attempting to seize Castelnaud Castle and its castellans, the Caumonts. The dynasty became increasingly rich and more influential during the 17th and 18th centuries as they preferred to spend time in their more comfortable castle at Les Milandes, rather than their castle of the Force, near Bergerac. Thus Castelnaud Castle was then neglected until the French Revolution. After that, vegetation invaded the site and Castelnaud became ruins which were used as a stone quarry. It also served as shelter for the resistance during World War II. In 1965, the castle was purchased by new owners, Philippe and Véronique Rossillon, who had it listed as an historical monument. Between 1974 and 2005, a series of major renovation works were undertaken in order to restore Castelnaud Castle to its former glory. Since then, the castle has been miraculously restored and is proud to welcome more than 200,000 visitors per year, a tenth of them being schoolchildren. A visit to Castelnaud Castle can be unaccompanied and takes approximately one hour to discover the interior, including the machinery room, the guard room, the artillery tower, the defensive equipment room, the keep, and the “chemin de ronde” (a protected raised walkway behind the ramparts) through many winding stairways and small chambers that children will be excited to discover. The kitchen is the last room before reaching the upper courtyard of the castle which features a medieval covered well. Fed by a groundwater table, it is 46 metres deep and protected by the 15 metres high surrounding walls surmounted by the chemin de ronde. The extensive and fascinating Museum of Medieval Warfare was inaugurated in 1985 under the leadership of Kléber Rossillon and was essential in placing the castle’s history and structure into a medieval context. The museum features an important collection of weapons and armoury from all over Europe (230 items in total: weapons for cutting and thrusting, artillery pieces etc. ), punctuated by furniture, and structural models. Detailed illustrations, interactive devices and media aids of various forms, located throughout the museum, help to give a clear idea of the nature of warfare during the Middle-Ages. Outside, high on the battlements, are displayed the most powerful siege engines that have been reconstructed full-scale to recreate the turbulent atmosphere of various moments of the past: bombards, trebuchets, mangonels, giant crossbows, and catapults. Amazing films show the use of the castle’s storming weapons on some of the walls that had to be demolished during the renovations. In the 13th century, a trebuchet was capable of throwing cannonballs weighing 100kg beyond the walls, while the catapults could throw a 5kg ball a distance of 40 metres. To end your visit, have a look at the medieval garden which has recently been added to the estate. The view of the Dordogne Valley from the terraces is remarkable, stretching from the village of La Roque-Gageac to Marqueyssac opposite and Beynac Castle to the right. Note that you can combine your visit to the Marqueyssac Gardens and Castelnaud Castle, using only one ticket. Theatrical spectacles are planned each summer from 8.15pm onwards and medieval displays take place daily, except on Saturdays. Throughout the year, you can reserve a private tour in English with a guide to discover the exterior of the castle, its history, the evolution of fortifications and war methods during the Middle Ages. To make the visit of the castle’s interior more enjoyable, a guide book is at your disposal at the welcome desk. In July and August visitors can participate to the same guided tours without additional charge and night time visits are organised on weekday evenings at 8.15pm. The night time visits are “theatricalised” with various actors dressed in medieval outfits. The Dordogne Valley is easily accessible by car from Paris, Bordeaux and Toulouse, via the A20 and A89 autoroutes (French for motorways). If you travel from Australia or America, you could take a flight to Paris Charles de Gaulle, and travel by TGV from the airport station straight to Bordeaux and rent a car from there. The TGV from Paris-Gare de Montparnasse takes 3 hours to Bordeaux. A SNCF coach links Sarlat to the train station of Libourne which has direct trains to Bordeaux. For more information about Castelnaud Castle (opening times/entrance fees/events), visit www.castelnaud.com.